..::: Download Space Paranoids :::.. This is an attempt at a playable, recognizable version of the game featured in "TRON" written by Flynn and seen in "Flynn's Place." The game should run relatively quickly on P3's and up. It is designed to run in a cabinet with a MAME type interface via iPAC. The original design was one player game with a Joystick with trigger (arrows and space bar), two buttons for turret rotation, a third button to align the turret with the tank body (point it forward as it is easy to get disoriented), and a start button (keyboard 1). The coin intakes would be keyboard 5 as a standard MAME interface. The new configuration is a dual joystick configuration. The left joystick is a Happ Topfire (simple joystick with a top mounted push button). This controls turret elevation, rotation, and the button rights the turret to align with the direction the tank is facing. The right joystick ( Xenophobe joystick) moves the tank forward and backward and turns it left or right. The turret rotate (as it should) with the tank, as well as with its independent control. The right joystick trigger fires. Click the cabinet for a closer look at the artwork. The game is recognizable as the one from TRON but is definitely not identical. Specifically, the recognizers are not textured (the model is in there and belongs to Tracy Brown- If anyone wishes to texture it for the right appearance, we will gladly update the game look and explosion subroutines). Also, the game is faster and perhaps more frustrating than its film counterpart. Gameplay, pace, and look should hopefully remind you of early Williams games. Plus, rather than wander a single maze for hours killing paranoids, each level has a key and exit that are collected in sequence to get to the next level. The HUD has been modified to include a distance sensor (a small number centered in the lower screen that tells you the distance to the key/exit). There is now a radar showing enemies and environment in the left lower corner. The radar revolves so that north is the direction the tank is facing. With a little practice, this allows you to maneuver when the turret is pointed askew of the tank. There is also an icon that appears in the right lower HUD if the tank and turret are not aligned. This is simply a model of the tank with the turret turned to show its current alignment. These latter features were added after a number of criticisms of the first beta saying that orientation and navigation were difficult at best. The radar and tank-turret display make it possible to drive the tank while targeting enemies behind or to the side. The final version has 15 levels - only the first of which is similar to that seen in the film. Other levels include an open mesa similar to Clu's chase in the film, collapsing discs like the Jai Lai game, cliffs similar to the tank-cycle chase, and a boss level with an MCP and an oversized recognizer replacing the gigantic Sark. There are a number of other levels with a TRONish feel but also a level in Matrix-code and a Battlezone type level. The giant recognizer in the boss level is very similar to the one in TRON "Deadly Discs" for the Intellivision. You disable it by shooting the "eye" and it launches spherical glowing nets to capture you. In addition, the game offers a full attract mode (7 subroutines) as it would in an arcade. There is a diagnostic mode (accessed by pressing "0" when the flashing text is on- the first thing the program does). This allows you to reset high scores to default, change music, toggle deluxe mode, and set refresh rate. there are 2 soundtracks in the version for download. You can add any MIDI soundtrack you like just by saving the files in the music folder as instructed in the readme. 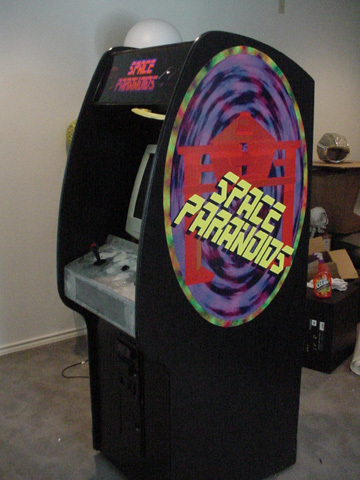 The deluxe mode setting switches all text and graphics to read "SPACE PARANOIDS DELUXE." This is for the purists (you know who you are) who realize the game is not identical to that in the movie. Ultimately, we hope the game works (there are still a few bugs) and is enjoyable to play. The "readme" file details contributors, controls, bugs and fixes, and copyright info. This software is intended as shareware and is not to be sold in any way for profit. If you enjoy it and wish to endorse it with your dollars, please buy licensed TRON stuff or CD's of the Ventures and Kraftwerk (the included MIDI). I heartily recommend the special edition TRON DVD (amazing) as well as TRON 2.0 (the light cycle game alone is worth the price). Hopefully, there will be pictures of the finished cabinet soon. The CPO needs to be redone for the new controls and the bezel is still in development.